Are you looking for a healthy snack in a glass? 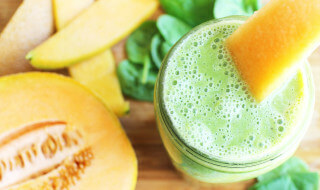 This melon mint smoothie is just what you need. With the goodness of yogurt and antioxidant-rich mint, this smoothie is sure to cool you off! Try this recipe and let us know. Add lime juice, cantaloupe cubes, yogurt, mint, honey, salt, and ice in the blender. Blend until completely smooth, about 30 seconds. Serve immediately garnished with mint if desired. Ladies, Look Younger and Fit at Every Age with a Healthy Diet!